PeerJ is celebrating the launch of our five new peer-reviewed Open Access journals in chemistry by announcing two major awards for chemistry researchers aimed at recognizing significant contributions to the field and rewarding open practices with award money to be won totaling $5000. Chosen by an esteemed and influential panel of chemistry experts (including two Nobel Prize laureates), the two major awards below will be awarded to authors based on the content and scope of the manuscript and/or preprint submitted. In addition to the Outstanding Manuscript and ECR Open Science awards, we will also be hosting a monthly raffle of $100 Amazon gift cards for all new submissions to the chemistry journals. By submitting a journal article or preprint during the competition timeframe you will be automatically included in the raffle. 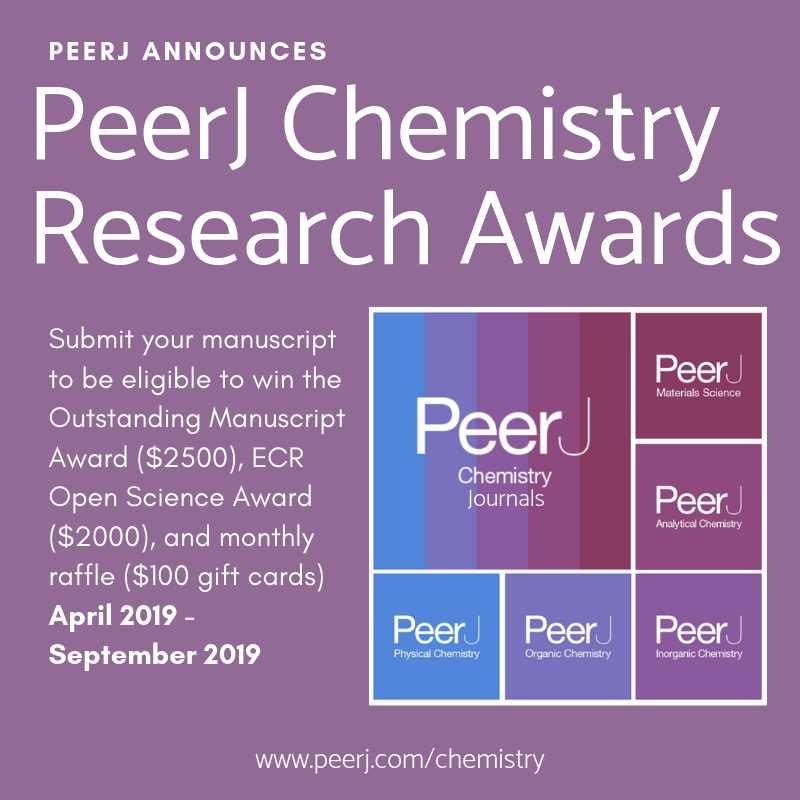 The PeerJ Chemistry Outstanding Manuscript Award and the PeerJ Chemistry ECR Open Science Award are open to all applicants who submit either a manuscript or preprint to one of the five new PeerJ Chemistry journals: PeerJ Physical Chemistry, PeerJ Organic Chemistry, PeerJ Inorganic Chemistry, PeerJ Analytical Chemistry, and PeerJ Materials Science. The Manuscript Award will be decided by our esteemed selection committee and will be based on their evaluations of the overall quality and innovation of the relevant contributions. The Open Science Award will also be decided by the selection committee and is open to Early Career Researchers, either currently enrolled in a PhD program or within 10 years of having been awarded a PhD. The Open Science Award will particularly be looking for manuscripts, supplementary materials and wider research outputs making chemistry research more accessible or available such as, but not limited to, software, study protocol, research dataset, data description, methods description, literature review, meta-analyses, etc. This is a great opportunity for researchers to get their work judged by an influential panel of chemistry experts, raise the visibility of their work, demonstrate transparency in science and receive the rewards that all too often go unacknowledged. Once you have a manuscript URL, please enter your details into the PeerJ Chemistry Awards Form. To enter the Monthly Raffle, all you have to do is submit a manuscript to one of the five new chemistry journals. All corresponding authors will be eligible. No further info is required. Good luck! In the meantime, we will be updating this post with more information on the monthly raffle winners.